One of my favorite ways to enjoy mango chutney is in a grilled cheese sandwich and the timing couldn’t be better as April is grilled cheese sandwich month. Panini Happy is hosting a grilled cheese pageant to celebrate and I thought that I would share one of my favorite takes on a grilled cheese sandwich. A couple of years ago I would never have thought to use something like mango chutney in a grilled cheese sandwich but then I tried a monte cristo sandwich which is basically a ham and cheese sandwich that is cooked like French toast and commonly served with strawberry jam. I was immediately hooked on the sweet and savoury combo and I have been making grilled cheese sandwiches with jam ever since. Shortly after discovering mango chutney I had the idea of trying a grilled cheese sandwich with it and now the mango chutney grilled cheese sandwich is one of my favorites! The sweet, tangy and spicy mango chutney goes surprisingly well with ooey gooey melted cheese wrapped in perfectly grilled golden brown bread! The flavors are fantastic Kevin – the mango chutney sounds amazing. Wow! That looks absolutely amazing. You are a great food photographer. Oh my God… grilled cheese and mango! How have I never thought of this?? Looks totally delectable. I’m so with ya on this! Oh my gosh, what a delicious sandwich! I’m drooling. Okay, that has GOT to be the most tantalizing comfort food sandwich EVER!!! Ohh man that looks good I love a good grilled cheese! I would have never thought of this. Great idea. I’m so hungry for grilled cheese and told myself no bread for two weeks! Torture. Kevin! That looks amazing. A wonderful flavour combination! What a brilliant idea! Can’t wait to try it. I usually put mustard on my grilled cheese but this sounds much more sophisticated. You never disappoint. I’m not usually a sandwich fan, but this is something I could not resist. Brilliant. What an interesting combination! Looks good! Beautiful grill marks, Kevin! And, marvelous combo of sweet and savory. Delicious. Wow, this looks good! I so enjoy looking in on your blog. You have some terrific ideas. Thanks for sharing. Love the idea. I usually use my mango chutney in curry. I like this in a sandwich. I didn’t even know mango chutney could go with cheese, that’s fantastic! 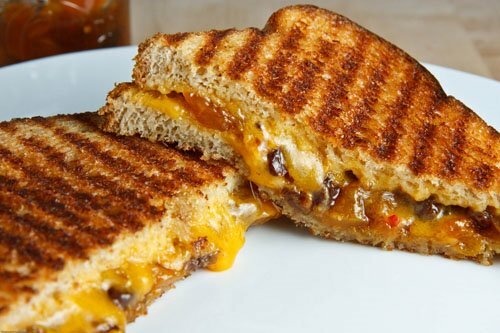 I would have never thought to add mango chutney to a grilled cheese sandwich, what an amazing idea! I love your blog, your food and how you mix and match flavors, delish. BRAVO! Kevin, it has been a while. I am doing some catching up tonight. Mmm on the grilled cheese with chutney and triple mmm on the pancakes. I hope you are well and that Easter was blessed. Oh, that looks good! What a creative sandwich, it looks super tasty! would love me some of this yummy goodness. So comforting! That picture is incredible! I love sweet and salty, and there’s nothing better than fruit with cheese. I’ll have to try out this one for sure. this snack really look great!! love grilled sandwich!! What gorgeous grilled cheese sandwiches! Yummy! What a great combo of delicious flavors! Hum, le fromage, j’adore ça ! Et sur du pain légèrement doré, c’est délicieux ! Hmmm….looks really great! Must have been tangy and yummy! Any chutney and cheese is a great combo, I also really like brie with black cherry jam. Like you I really like sweet and savoury combined. My friend invited me for lunch the other week and made a mango chutney sauce to serve with grilled tuna steaks, which was delicious. Wow. I can barely handle the ooey gooey goodness. What a wonderful flavor combo. I love mango chutney, what a unique way to use it! Looks delicious! Interesting combination. I love grilled cheese! It looks fantastic. It’s Grilled Cheese month?!! I’m glad somebody told me … I can’t let this pass … must go stock up on melty cheeses now!! And that combination sounds awesome. You’re so good to make your own chutney! This is a brilliant idea. We’re cooking LOTS of grilled cheese over at Pithy and Cleaver, so I’m a teeny bit tired of it, but this one is inspiring! We just made some grilled cheese this past weekend, with bacon & tomato .. mango chutney sounds like a nice twist on a classic! This sounds great. I have to try this combo! excellent use for your chutney, kevin! the sweet and salty flavors of your sandwich would be outstanding! This looks great! The sweet/salty/spicy combo would be right up my alley. Looking good as always! Mango and cheesE!!!!?!?! Oh, that looks so good. I can just taste this–what a great combo! Mango chutney would go beautifully in a grilled cheese, great idea! The mango chutney here sounds like a delicious addition! Truly one of the best uses of mango chutney that there is. We just did this the other day! Oh wow, your sandwich looks incredible!! I love your sweet and savory grilled cheese idea – I just made a big batch of chutney (a simple apple cumin chutney, though – not quite as scrumptious-looking as your mango chutney :-), so I think this is the perfect occasion to give some grilled cheese and chutney a try! 🙂 Thank you for the great idea! The sweet & savory combo is certainly a winner. This photo looks so appetizing… I'm grabbing my afternoon snack right now! I never heard of Grilled Cheese Sandwich month. I had better start eating sandwiches, eh? Tried it. Loved it. Thanks for the idea and recipe. I have alway likes your grilled sandwiches! Somehow, those brown lines make everything look so much tastier! Oh yeah baby, now we are talking!!!! I do sort of the same thing, but I use strawberry jalapeno jelly, or raspberry chipotle jelly and a slice of smoked turkey or ham. YUM! Yours looks delish! Putting mango chuntney into grilled sandwich is one of my favourite things. I think its something that started as a kid when I used to visit my dad in Australia and he used to have this sandwich maker I’d use to throw together a quick lunch. Looks delicious with meted cheese! This recipe is brillant! I am really glad you posted this one. I’m not surprised that this is one of your faves, it sounds delish. When I was a kid, one of my favourite treats was a toasted cheese and jam sandwich – great minds think alike! Your recipes and photos are amazing! I knew the photo but forgot your site. When I saw your photo of spinach pie on another site I decided to hit images and located you again. You’re in my favorites now. This is the site using your photo. My taste buds are in heaven with this complex twist off flavors on a comfort food classic! I made some mango chutney and fresh cherry chutney a month ago, so tried this with the cherry chutney. WOW! WOW! Tried this with my homemade cherry chutney.